I just downloaded the license for the English SAI, but everytime I try to run it i get a message that SAI cannot be run. Re: trouble with license! Please help! First of all, you shouldn't run license. 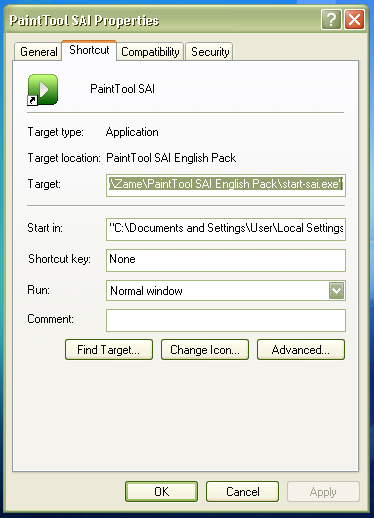 Second - you must put license file into SAI installation folder, other folders will not work. 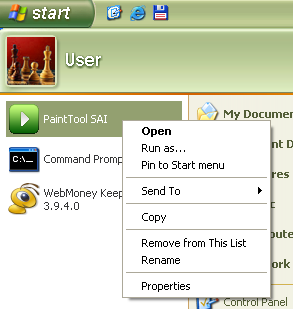 How to find where SAI in installed? Instruction for Windows XP (actually, it will not differ very much for Vista and Windows 7). 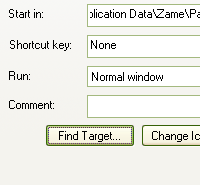 3) Click "Find Target" or "Open File Location"
I am no good with computers, so this was an emence help!! Hello. I have a similar problem and though I've followed the steps to the letter - crossing the t's and dotting the i's - I cannot, for the life of me, have SAI running. I have purchased the English pack, downloaded successfully, have my license, and I've dragged the license down to the folder and everything - both how it's shown here and following the step by step instruction at the official site. Nada. SAI opens up normally but it showns the grey background. No canvas and no tools. I have confirmed I have the license, no trial version, by clicking on Others > Version Info. 1. Do a FILE / NEW to create a new canvas. Did a canvas appear? 2. Make sure WINDOW / HIDE COMMAND PANELS is not selected. Once your sure it's not selected, try WINDOW / Reset All Window positions. If that doesn't do anything for you, make sure you have only 1 version of SAI installed. If you had a trial version and then installed again, you may have two versions. Second, if your on Windows 7, make sure you are installed someplace 'safe' ... NOT any version of the program folder ... by default it should reside in a hidden folder in your user folder. And if none of that works, write back with your OS, install path, and version of install, and we'll see if we can make it work. trouble with Sai Please help! I just wanted to say Thank You to those who've posted answers to this problem. The solution wouldn't have been clear to me at all without this very simple but helpful "tutorial." Sai's a pretty amazing tool. I'm glad this forum is here. Much appreciated. I'm having a similar problem here, but I did every little thing that was said. I still get the Trial Version and no full version. It's not working for me. However, I did not know that I wasn't supposed to open the license file. I opened it with notepad and then saw that it said not to open it. Could opening the license file have screwed everything up? Would anyone happen to know how to fix that? waaa~! !i cant get it right!!!! have problems with license please help !!!! i paid for full version. did all the steps. and it still say trail version. tried 20 times !!! please help !! I do not see the license file in your screenshot. 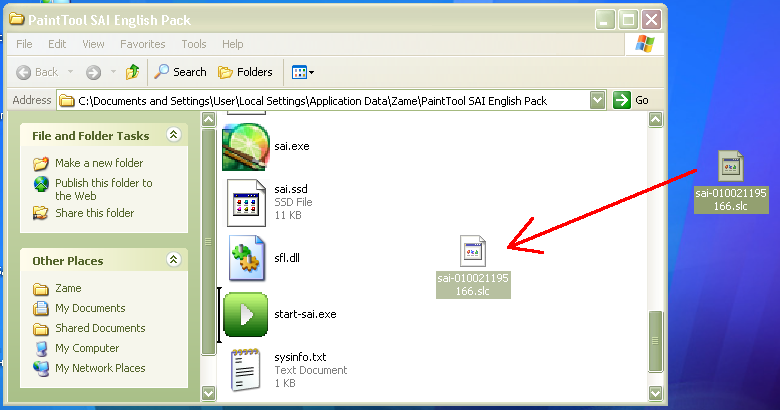 When you fill in the license form - https://www.systemax.jp/en/license.html - it should automatically give you a download file called sai-nnnnnnnnn.slc (where the 'n's are a bunch of numbers) - I do not see that license file in the folder. Note: you need to fill in the system ID field with the number generated by the trial on the same computer where you are going to put the license file. You cannot use the system ID from one computer to generate the license file for another computer.